While traveling in Japan last year, I saw a lot of folks on the street wearing face masks, but none of them looked quite like this! 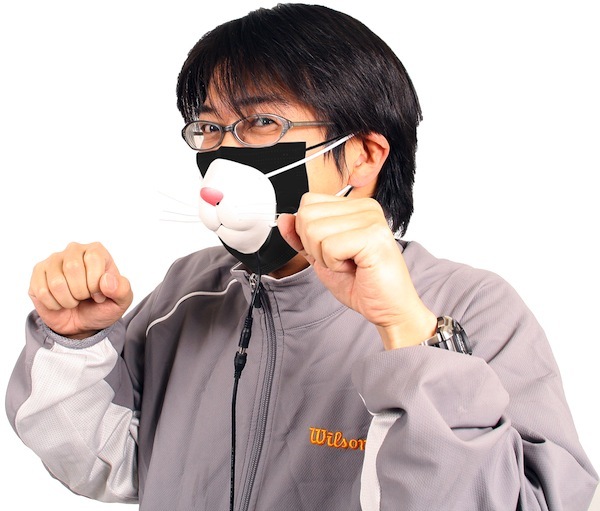 Designed for people who complain of trouble breathing with conventional masks on, this kitty mask comes with a USB or battery powered fan to keep the fresh air flowing in while keeping germs and allergens out. Want to try one out for yourself? The mask is available now for around $24.00 at Thanko. Oh my. I wonder if the air circulating makes a hissing sound as well. We think that would make it purrrfect! Megan is right, "only in Japan"
Haha! It's cute, but no I don't think I would want to wear that around town. Try as they might... hoomans will never even come close to being the glory that is us!